Gun control legislation dies in the Senate: The National Rifle Association and the gun rights lobby will continue to win until Congress pays a political price for supporting the Second Amendment above all else. 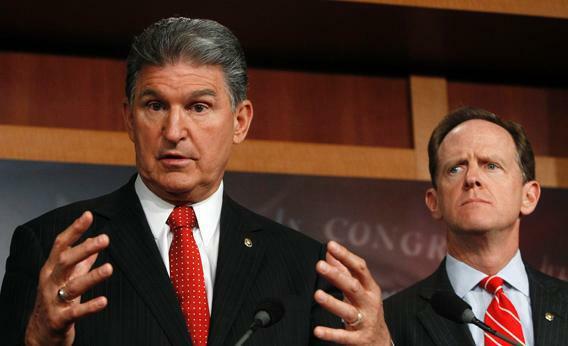 Sen. Joe Manchin, D-W.Va., and Sen. Pat Toomey, R-Pa., hold a news conference on background checks for firearms on Capitol Hill in Washington April 10, 2013. Newtown was not enough. On Wednesday, Democrats could not round up enough votes to overcome a Republican filibuster of a proposed compromise on background checks, which was the centerpiece of their legislation. The tragedy last December at Sandy Hook Elementary was supposed to tip conventional wisdom, which held that supporters of gun rights were more passionate and likely to hold their lawmakers accountable than supporters of gun control. In the end, the conventional wisdom held. Now gun control advocates like Michael Bloomberg will have a chance to make good on their threats to hold these legislators accountable in the next election. It may be even more difficult than getting a bill passed. For those who would like to exact electoral revenge, the easiest targets would be the vulnerable Senate candidates up for re-election in 2014 who voted against gun control. There are three such candidates who voted against the background check amendment. They are all Democrats. That means, if Michael Bloomberg and other supporters of gun control want to exact punishment, they are likely to help Minority Leader Mitch McConnell get halfway to his goal of becoming Senate Majority Leader. All five of these Democrats voted with Republicans in the failed attempt to beat the filibuster against an alternative bill put forward by Republican senators. That measure—which would have expanded Second Amendment rights while making it hard for the mentally ill to get firearms—increased funding for prosecutions and cracked down on gun trafficking. Gun control advocates disliked the bill. Will they work against all five Democrats, or spare the two who voted to help the background check bill? In his remarks, President Obama only called out the Democrats who voted against the background check for condemnation—that also included North Dakota freshman Sen. Heidi Heitkamp. And boy did he call them out, calling them essentially cowardly for caving to political pressure. “All in all this was a pretty shameful day for Washington,” said the president. The four next most vulnerable seats in the Senate are all held by Democrats who are retiring. Whoever runs in those races can’t be targeted by gun control advocates because they have never cast a Senate vote. The most electorally threatened Republican is Maine’s Sen. Susan Collins, who along with three other Republicans, voted for the Manchin-Toomey compromise. The rest of the Republicans up for re-election in 2014 face electorates more likely to praise them for protecting the Second Amendment than punish them for thwarting gun control, which is why all of them voted to kill Wednesday’s gun bill. The test for gun control proponents is to prove that their grass-roots supporters are as single-issue focused as the gun rights crowd. That’s a harder task when control of the Senate is at stake. Republican Minority Leader Mitch McConnell needs only six seats to take Sen. Harry Reid’s job. A voter who wants to punish a Democrat for his votes on gun measures will have to weigh how much they want to help Mitch McConnell in the process. Of all the Senate Democrats likely to be targeted by Bloomberg and his allies, Sen. Mark Pryor may be in the toughest spot. He only has a C- rating with the NRA, which means the organization would be happy to see him go. For Pryor, the vote merely helps him avoid more problems than he already has with conservative voters. “Sometimes you vote just to limit your pain,” says one Senate veteran evaluating Pryor’s predicament. Now Pryor will have to wait and see how much gun control advocates will be able to make good on their threats to mobilize black voters against him. While Democratic strategists concede that it will be hard to punish individual senators, they do predict further erosion for Republicans nationally. In a recent Washington Post poll, only 23 percent of Americans believe that the Republican party is “in touch with the concerns of most people in the United States today.” (Fifty-one percent say Obama is and 43 percent say Democrats are). That brand problem is worsened when Republicans vote against measures that have broad popular support. Polls consistently show that a vast majority of the country supports background checks for those gun sales in which background checks are not already required by law. Though Republicans will rightly point to the Democrats who voted against their own party and president, the popular perception that Republicans stood on the opposite side of a majority view is irrefutable. After the votes Wednesday, Democratic Sen. Richard Blumenthal of Connecticut said the vote was a “delay and not a defeat.” If that’s true, will it be the next election or the next massacre that does it?